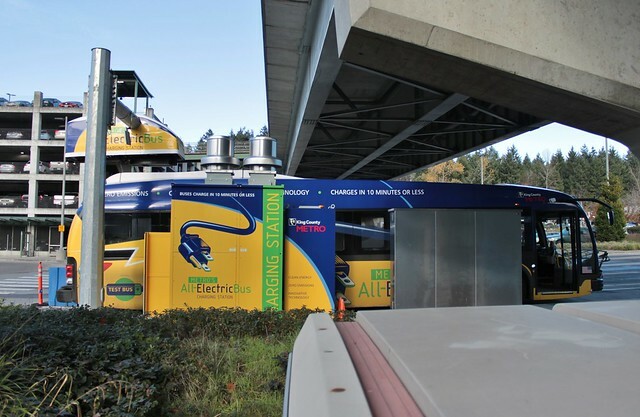 Everett Transit and Pierce Transit are the lucky recipients of federal grants to purchase new buses powered by electric batteries, similar to those operated by King County Metro on the Eastside. The Federal Transit Administration’s “Low or No Emission Vehicle Program” awarded $55 million in grants to 21 transit agencies nationwide. Everett Transit will use its $3.4 million grant, which requires a $600,000 match from the city budget, to purchase four buses from Proterra, but will not build a fast-charging station like Metro’s at Eastgate Park and Ride in Bellevue. The new buses will replace the agency’s 4 oldest high-floor buses, dating back to 1994 and 1996, and will be used on the city’s busiest routes, including route 7 on Evergreen Way. Everett Transit cited the high cost of diesel fuel, which has now become the largest operations expense for the system, as a reason for their pursuit of the grant. Pierce Transit, meanwhile, will only receive $2.6 million after it had requested $6.3 million. They will be able to afford only two electric buses from Proterra, as well as a fast-charging station. The agency already uses a fleet of buses powered by compressed natural gas (CNG), which are cleaner burning than traditional diesels, but the new electric buses will further reduce emissions. Across the mountains, Link Transit in Wenatchee is also set to receive $3.8 million from the same program to purchase five buses and a fast-charging station. They already operate electric “trolley replica” buses on their frequent circulator routes in downtown Wenatchee and East Wenatchee, funded in 2010 by a different FTA grant. Since Everett Transit won’t be getting a fast charging system, how will they operate their buses? Get a slow charge at the layover spot? Slow charge at the base. I was actually just talking to a Proterra sales rep, and they make two kinds of vehicles: Fast Charge and Extended Range. Fast Charges run for maybe 30 miles and recharge at a terminal. Extended Ranges run for a whole shift and then recharge at the base. I believe that they use different sorts of batteries for them, so an Extended Range vehicle can’t “top off” at a Fast Charge station. He mentioned that most agencies who buy Proterra for long-haul routes choose Extended Range. Right now Fast Charges are mostly used for circulator-type routes like the ones in Bellevue. Is Link not buying Proterra? Unsure at this point. Link went with EBus for their first electric buses, so they may be the first choice. Link is purchasing BYD electric buses. For trolley buses, yes. For battery buses you have battery weight. There might also be current limits on what the batteries will safely deliver. Everett Transit cited the high cost of diesel fuel, which has now become the largest operations expense for the system, as a reason for their pursuit of the grant. Huh? Crude oil is at a historic low. I find it impossible to believe that “high” fuel costs exceed the cost of labor; or that it’s even close! They might be using drivers they would have to pay anyway. San Juan Transit uses mostly school bus drivers that aren’t working during the time the public buses are running. Maybe they hedged poorly, thinking that fuel prices would be higher? Given that fuel is something like 10% of Metro’s operating cost (and I think labor is somewhere in the range of 70%?) that would rank as the worlds worst hedge. Hedging is just a sunk cost that gives you the right to buy fuel at set price in the future. If the market price is less you buy at that price and the futures contract simply becomes worthless. But even if by some strange twist of accounting you applied the cost to current operating expense it just doesn’t make sense. Labor costs don’t become a smaller percentage of operating costs just because “you’d have to pay the drivers anyway”. If anything that increases the cost percentage of labor. This sounds more like a PR spiel that’s just just flat out wrong. It’s not like other transit agencies because it is the city. The city could have some other driver pool other than transit drivers, or they could be using the same pool as their paratransit service. There’s probably some way to dig into the city records and find out. The City of Everett Budgets indicate that transit is it’s own entity separate from all other city functions like Parks, Libraries, etc. On the Everett Transit website I can’t find any budget info. I did find their Transit Development Plan 2014-20129. If you take the given fuel consumption and assume $3/gallon and double that (i.e. fuel is 50% of the budget) they are operating buses at an incredibly efficient $9/hr. That is complete crap. Either the statement is being misrepresented or someone is just flat out lying to taxpayers. Total operating expenditures are ~$22M. That makes diesel fuel closer to 5% of operating costs. Which would makes sense for a smaller agency like Everett that would not have efficiencies of scale to apply to things like maintenance of transit centers.